From the very start we used to say that FCP has one of the best type-setting tools around, it's called Photoshop. Indeed, the basic FCP type-setting filters, (being nice here), were weak. A number of third party vendors started creating Text plugins which gave better results, but these plugins were limited in what they could do. All this changed when Apple shipped FCP 4, which included several new applications, LiveType amongst them. 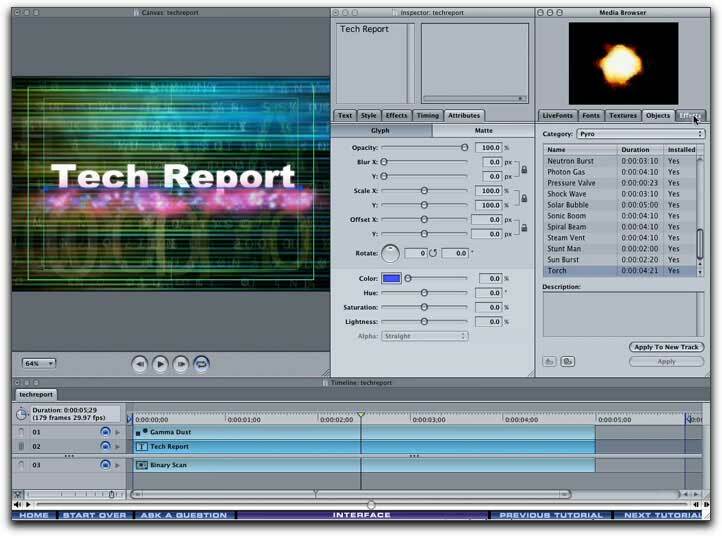 LiveType is not just a type-setting application but rather is a powerful motion graphics and titling application. While it is not hard to do some interesting titling in LiveType using the supplied; Presets, Glyphs, Templates, Textures, LiveFonts, Objects and Effects, this program offers much more, its abilities go deep. The trick is to learn how to use the features that lie just below the surface. If you are new to LiveType or have been working with it for awhile and now want to create some truly exciting and unique effects, it's time to get some help. Over the past number of years, since the introduction of FCP 1, DVcreators.net has been producing excellent tutorials that have guided us through, not only FCP, but other Apple applications that work with and support FCP. The tutorials from DVcreators.net have always set the standard for quality, with high production values, thorough and well thought out lessons, excellent tips, shortcuts and some advanced techniques that help the student grow past the basics. 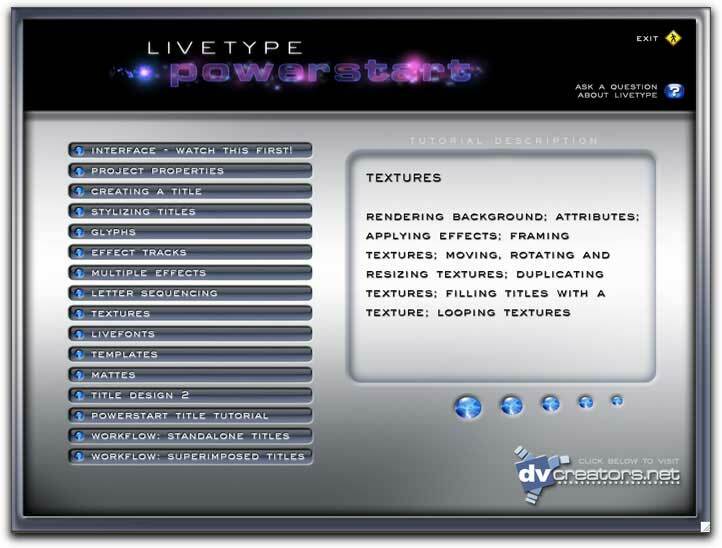 The LiveType PowerStart DVD Tutorial is no exception. When you launch the LiveType tutorial you are presented with an easy to navigate interface. Each of the lessons are listed down the left hand side. Starting off with a complete tour of the LiveType interface, the lessons take you through each of the different elements of LiveType. After working through and learning the basics of LiveType, the lessons continue on, now based on what you have learned, culminating with some advanced lessons that teach you how to create exciting and original effects. The tour of the interface takes us through the different windows; Canvas, Inspector, Browser and Timeline, with each demonstrated and the working relationships between these elements explained. At the bottom of the interface is the DVcreators.net navigation bar. Part of the power of this tutorial is the ease with which you can navigate from lesson to lesson, to stop and backup and replay a section. There is an old saying that "the devil is in the details", and this tutorial pays attention to those items that we need look at even before beginning to work in LiveType. 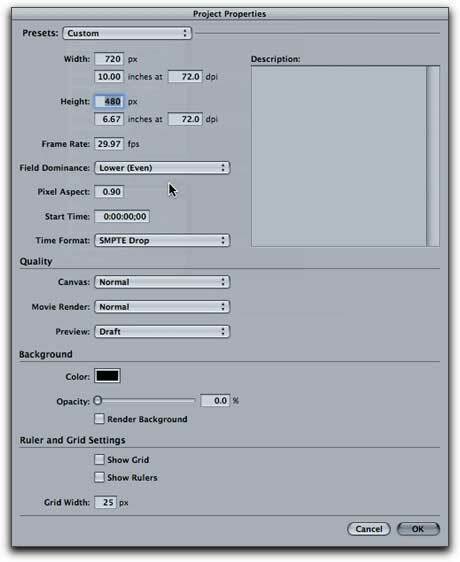 Shown below is Project Properties and we are walked through the process of setting up a project to match the settings of our FCP sequences and even how to save these settings for future projects. It is essential to get these settings right. 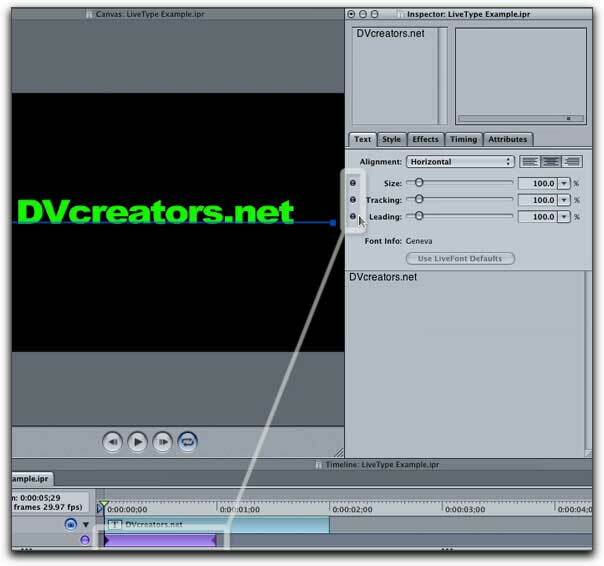 As in the more recent DVcreators.net tutorials, Josh Mellicker is our host and instructor. Josh has a warm and friendly manner which makes using this tutorial enjoyable as well as effective. As the tutorial movie plays out on our screens, overlay artwork is added to point out the areas of discussion and demonstrate the point at hand, a very helpful teaching tool. Along the way we get 'Power Tips' and other sidebar information to help us accomplish our task and keep us out of trouble. The LiveType Tutorial from DVcreators.net is excellent and is what I have come to expect from this company. Particular attention is paid to the Inspector and the Timeline where our text effects are built. If you are new to LiveType or have been using it for awhile and want learn how to use this application to its fullest potential, then this tutorial is for you. The lessons are clear and thorough, the pacing of the lessons are comfortable and the art work and movies are handsome. This tutorial does its job well.